There are two rules that I have when it comes to sunglasses. One, I always take them off when I'm talking to someone. It's just so weird to be carrying on a conversation with a person and not be able to see their eyes - I never know where to look. Two, for me it's all about the cheaper the better. I'm not someone who is willing to spend any considerable amount of money on a pair of sunglasses that are just going to be tossed around in my car, shoved into my diaper bag or buried under papers on my kitchen counter. As long as they keep the sun out of my eyes and they look good, that's all that I need. 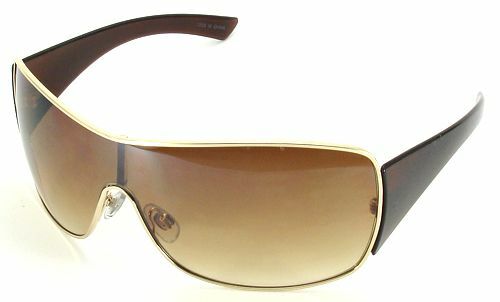 Therefore, there really isn't a better place to shop for stylish and affordable sunglasses than SunglassWarehouse.com. With Sunglass Warehouse's super-fast shipping, the SW Shield Style #1199 sunglasses arrived just in time for me to bring them with on our vacation. 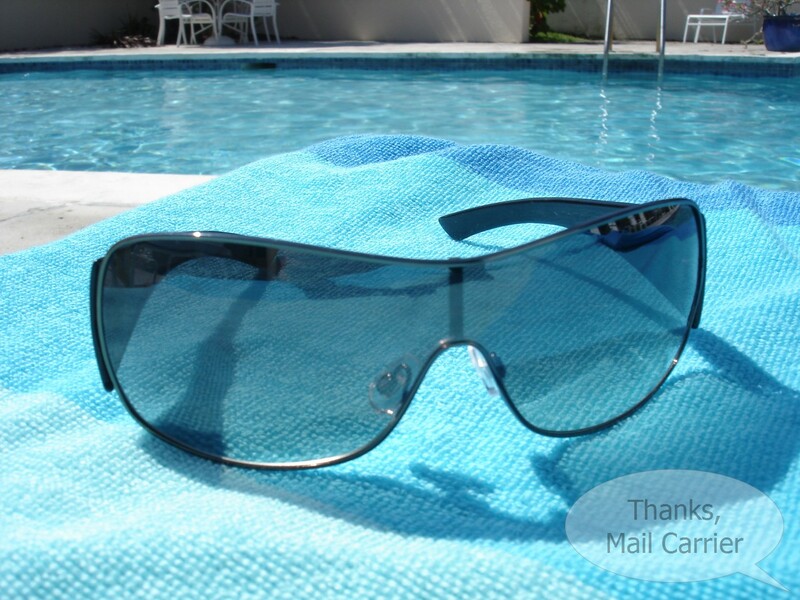 The perfect style for wearing to the beach, pool or out sightseeing, I love the way these frames are sleek and trendy while offering UV400 protection from the sun and blocking harmful UVA and UVB rays. I also really like the way that these sunglasses are so comfortable that I don't even remember that I have them on when wearing them. Instead of constantly adjusting or having to take them on and off because of the change in color that other sunglasses sometimes give, the SW Shield Style #1199 rest lightly on my nose as if they belong there. The one-piece lens was exactly what I had in mind when I finally decided on this pair, as I love the way this popular style is eye-catching and fashionable without being overpowering and taking over your face. I went with the Black and Grey Frame option but Sunglass Warehouse has 5 color choices so that you can find the one that best suits your look (such as the Brown and Gold Frame at right). Although they were a tad large on Little Sister B, Sunglass Warehouse in fact does offer a cute selection of Kid's Sunglasses that would be a little more her size. From brightly colored large frames to smaller, sleek mini-adult styles, they are almost all under $10 and would work for a variety of ages of kids. With customer service as their top priority, Sunglass Warehouse has provided quality sunglasses at affordable prices to thousands of satisfied customers. I love the way that they manage to capture the designer look without the inflated price tag to go with it. You're able to purchase traditional, classic frames or trendy, celebrity-inspired ones and not feel as though you have to spend a fortune. What could be better? Well, how about winning a pair of the bestselling SW Oversized Style #167 shown at left? From now until May 31, Sunglass Warehouse is running a "Grab Our Button" Contest where 3 lucky winners will have the chance to bring home this cute style that celebrities like Jennifer Aniston and Kate Hudson have been seen wearing. Find the details at SunglassWarehouse.com/blog and grab that button to be one of the 3 winners! Two lucky people will win their choice of sunglasses from Sunglass Warehouse! 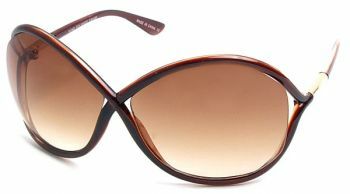 To enter to win: Visit SunglassWarehouse.com, browse their stylish selection and tell me which one is your favorite. 3 Extra Entries if you blog about this giveaway linking back to Thanks, Mail Carrier and SunglassWarehouse.com. Please leave an address where it can be found. Giveaway will end on June 3rd at 11:59pm CST. Do me the favor of leaving an email address or making absolutely sure it is visible in your profile, I have to have a way to contact the winner. The winner will be chosen by random.org and announced here as well as emailed and will have 48 hours to contact me or respond to notification or a new winner will be chosen. This giveaway is open to residents of the U.S. and Canada only. A big thank you to Sunglass Warehouse for providing the SW Shield Style #1199 for me to review as well as the sunglasses of choice for two lucky giveaway winners. The opinions shared are my own and honest and if you really need to see more, click here to see how I roll. I'd pick SW Fashion Style #15015! I entered the Soda Moby flats from ZooShoo giveaway. I entered the Little girls collection of Stella & Dot giveaway. I entered the DownEast giveaway. I'm following and I tweeted. Part of me wanted to pick those retro 80's sunglasses, they always flattered my face shape but I do love the SW Oversized Style #167. More modern and have flare. i follow sunglass warehouse on twitter as scoop500. I would pick the SW Polarized Aviator Style #1680 for my husband! I would get the overxcast large polarized sunglasses 1398. Hi what a fun give-away. Just wanted to let you know I am starting a Neige give-away on Friday morning. I follow you already!!! Wow, so many choices! I think I'd like SW Vintage Aviator Style #3338. Thanks! I like the women's polorized sports style-red. I like the SW Oversized Rhinestone Style #302.
bonus entries. Liked on Facebook and posted on their wall. for my husband b/c they could fit over his regular glasses. I like the SW Polarized Style #27. I follow Sunglass Warehouse on Twitter. I'm in the digital frame giveaway. I'm in the CSN giveaway. Those are some great glasses!! Visiting via Friday Follow. Happy Friday Follow! I am doing a review and giveaway for them in a couple weeks. In fact I got my sunglasses from them today and LOVE them! If my # is chosen, I will give my entry to the gal in front of me since I just got my pair. happy friday follow! i hope you can also follow me in google friend connect and my rss. I like the SW Fashion Style #8757. My favorite is the SW Oversized Style #163 with the purple frame. I love the SW Rhinestone Style #2716,just perfect! !